The collective excitation of a spin ensemble results in a spin wave in the microwave (GHz) regime which exhibits a quasiparticle behaviour, termed magnon. Among others, previous works reported excitation and detection of magnons at cryogenic temperatures1, the coupling of a magnon to a microwave cavity2, 3 and the coupling of multiple magnon-resonator states within the same cavity at room temperature4. Experimentally, we interface magnons with microwave cavities to investigate dynamics within the magnetic system. To this end, magnonic elements are strongly coupled to a photonic resonator, resulting in hybridized magnon - resonator states, i.e. magnon polaritons. This allows for the study of properties such as their intrinsic linewidth and magnetization. In our setup, we resonantly couple spin waves in a magnetic bulk or thin film sample to a microwave cavity in the strong coupling regime. We employ ferromagnetic resonance (FMR) and input-output theory at temperatures from 5K to 300K allowing for temperature dependent measurements of the coupling strength g and intrinsic linewidth of garnet samples (Fig. 1). We determine the temperature dependence of the coupling strengths and the resonance fields and we also determine losses of the coupled magnon – resonator system. Using a coplanar waveguide (CPW) resonator, broadband measurements are possible to probe the frequency dependence as necessary to understand the coupling and dynamics of magnons and magnon-polaritons. Figure 1. 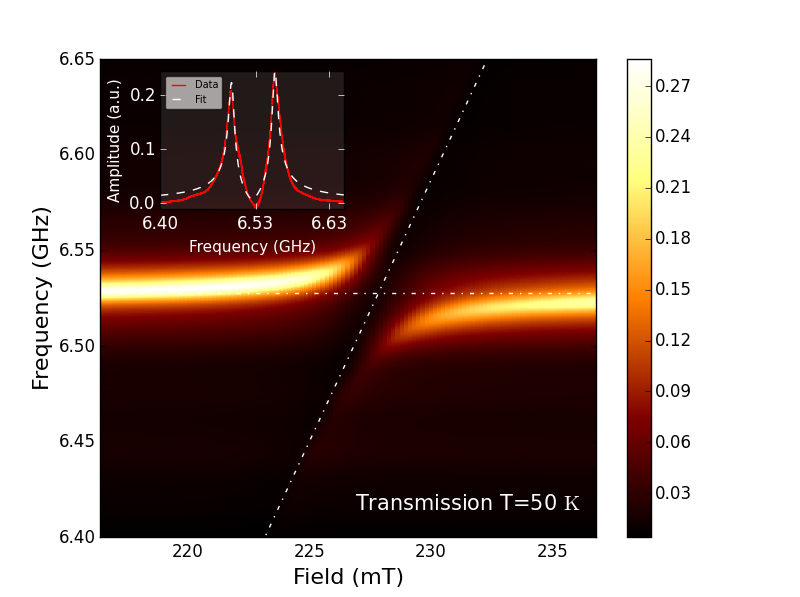 Transmission S21 measurement of the dispersion for the cavity-magnon-polariton for T=50K. The field of resonant coupling is at 227mT with a coupling strength of geff/2pi=29MHz. Exemplary, the inset shows the background corrected resonant linear amplitudes of the coupled system with a fit. The red line shows the background corrected data, the other one (dotted) the corresponding fit. The dotted lines in the main plot illustrate the uncoupled dispersion of the cavity (field independent) and Kittel magnon (field dependent). Karenowska et al., arXiv: 1502.06263 [cond-mat.mes-hall] (2015). Tabuchi et al., Phys. Rev. Lett. 113, 083603 (2014). Zhang et al., Phys. Rev. Lett. 113, 156401 (2014). Zhang et al., Nat. Commun. 6, 8914 (2015).